Templates are a critical part of drafting and design. Templates give designers access to accurately scaled and consistent shapes that can be used to create the most complicated layouts. A benefit of templates is that they are portable, durable and can be used with a variety of drafting tools. Every studio should have a few types of architectural drawing templates on hand at all times. Everyone who does draft or design work should have a set of plumbing templates. These templates are used for a variety of things such as laying out pipework or designing an entire bathroom. The templates are good to have because there are so many shapes and symbols that can be used every day. They are necessary shapes for designing nearly any type of interior or exterior space. Additionally, some of the shapes are relatively generic and can be used to create other types of designs or patterns. Every studio should have a collection of plumbing templates available. Some of the most useful and flexible architectural drawing templates are those designed for landscaping. 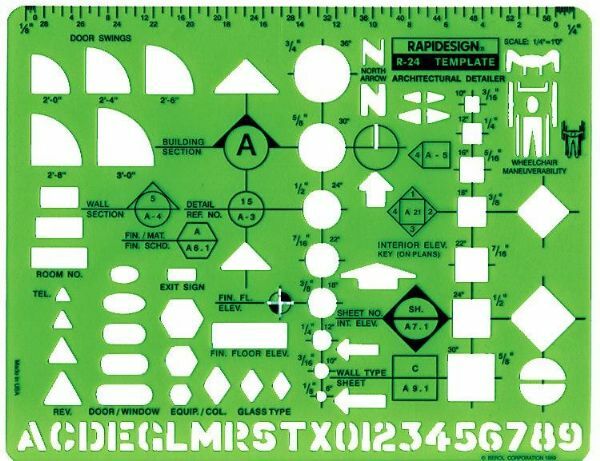 These templates are geared towards drawing a variety of unique shapes meant to represent trees, walls, pathways, and bushes. The most interesting aspect of landscaping templates is that they provide a number of organic shapes and curves that are simply not present in any other form. Some of the templates even have French curves along the sides to allow for flowing designs. Landscaping templates are a valuable addition to any studio even if outdoor designs are not done on a daily basis. Home design and fixture templates are a necessity for anyone doing basic layout, design or drafting work. These templates include a wide range of standardized shapes used to describe everything from the placement of fixtures to the layout of furniture and doors. Anyone who is going to be doing architectural or interior design work is going to need most of these shapes at some point. The templates are available in all the most common scales so that they can be matched to any project. Home design and fixture templates can make finishing projects much easier.